Driving back from work the other day, Sunday October 28 to be precise, I noticed a bright sundog on the right side of the sun as we came around the corner at Button Point. 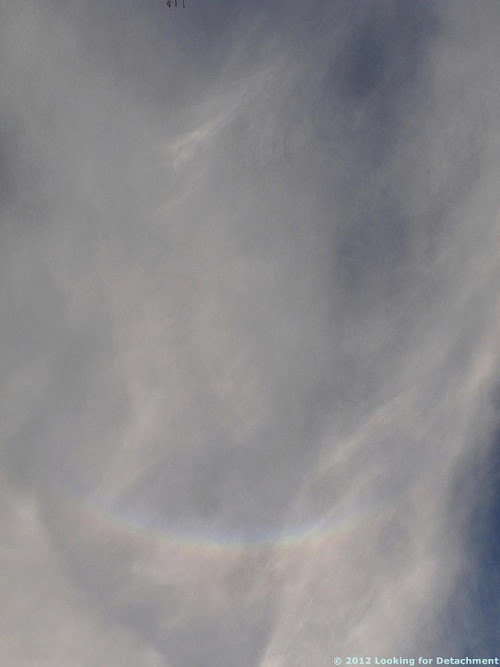 I looked straight overhead, hoping to see a Kern arc, and there was the so-called circumzenithal arc, which does not make a complete circle around the zenith. 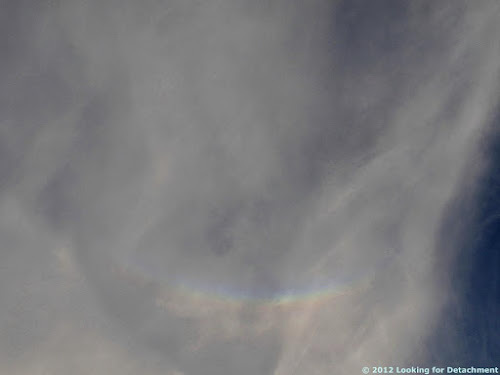 When I got home, I ran in, grabbed my camera, took one quick shot of a fairly faded arc before the batteries died and before the arc faded almost completely in fickle cirrus clouds. After changing the batteries, and after the arc came back a couple minutes later, I took the above photo, where the arc is still faint. 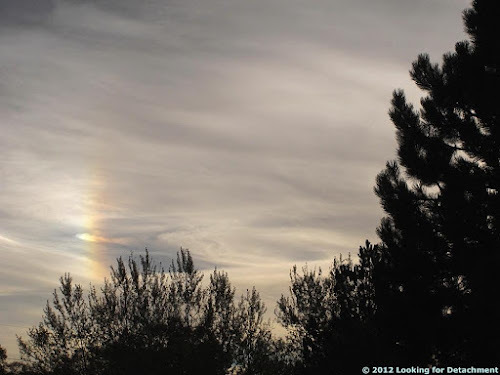 By the time I took this picture, two sundogs had formed on opposite sides of the sun (the right one is not visible behind a building to the right; the left one is the bright, washed out spot on the left), and a nice halo had started to develop. 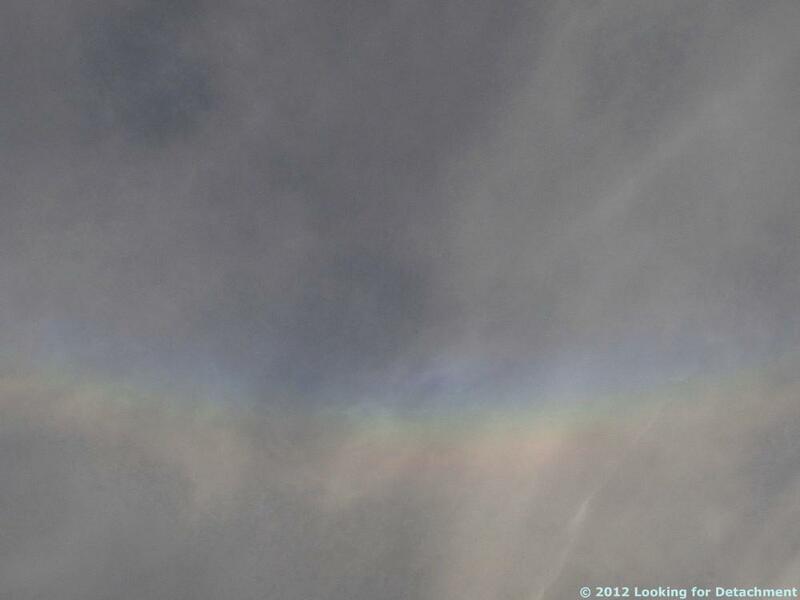 Unenhanced circumzenithal arc looking straight up. I repeatedly looked straight overhead to see if the rare Kern arc, which completely circles the zenith, would develop. One never did. Circumzenithal arc looking straight up, somewhat enhanced. 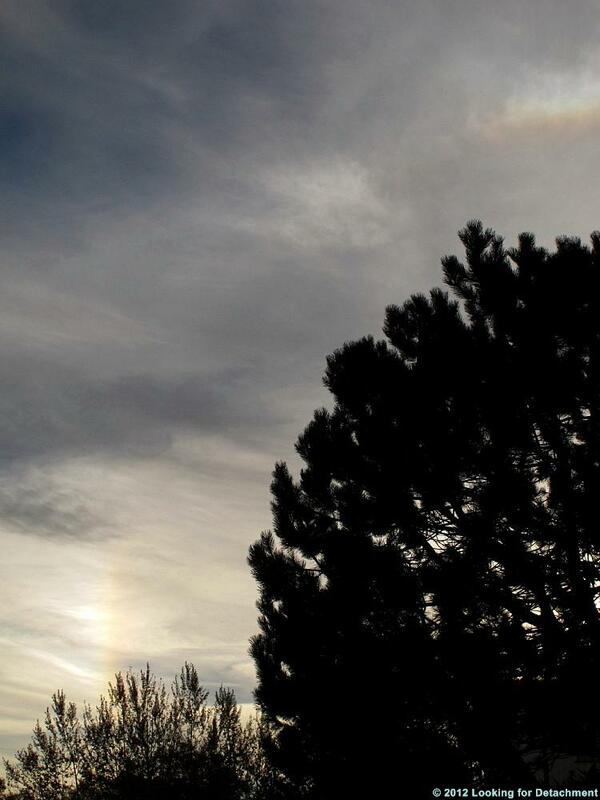 A view of just the circumzenithal arc. A zoomed in view of the same arc, taken a moment later. 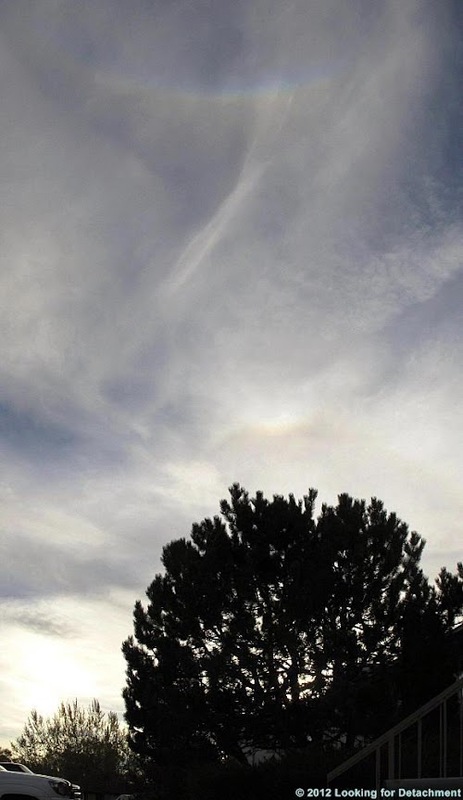 The halo around the sun continued to develop. Halo mimics the shape of the tree. Sundog to the left of the sun. The sun was fairly low in the sky between 4:32 and 4:47 pm PST when I took these photos; it was probably between 10 and 15 degrees above the horizon, a little lower than the ideal 22 degrees. The following day, I ran outside with my Brunton at about 4:50 pm to measure the sun angle, which was at 10 degrees above the horizon. The days are getting shorter by only 1 to 2 minutes each day, with minimal time difference in sunset between the two days in question, so the sun was probably at 10 degrees or slightly higher. 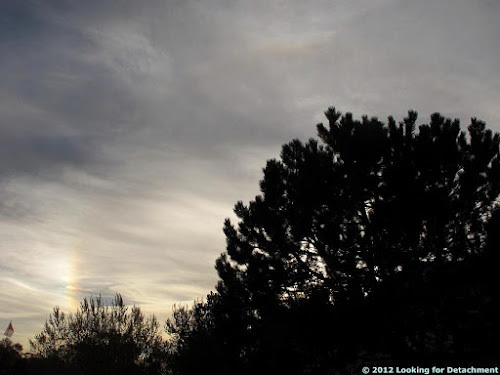 In fact, photos in which the ground isn't cropped out show that the height of the sun above the horizon is less than half of the 22 degree halo around the sun, although some distortion by the camera cannot be ruled out. All photos except the one described as unenhanced, were enhanced by increasing color saturation and contrast, and by adjusting the brightness up or down as needed. They were then exported to a smaller size (1000px long dimension). After export, they were minimally sharpened to diminish blurriness imparted during export. The first two photos both consist of two photos that were stitched together and cropped prior to enhancement, export, and sharpening. My semi-wide angle lens won't show a circumzenithal arc and the lower part of the sky in one shot. 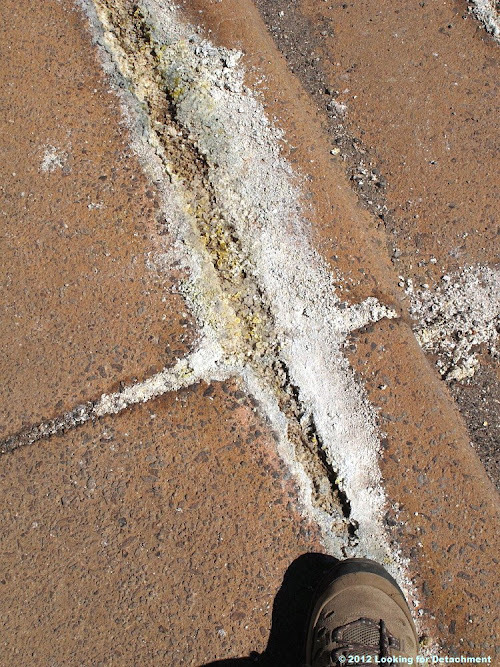 While at Lassen Volcanic National Park on our first recent visit, which was early last month, we noticed that the sidewalk near the boiling mud pot at Sulphur Works had lots of mineral (and extremophile?) growths in many of the cracks. 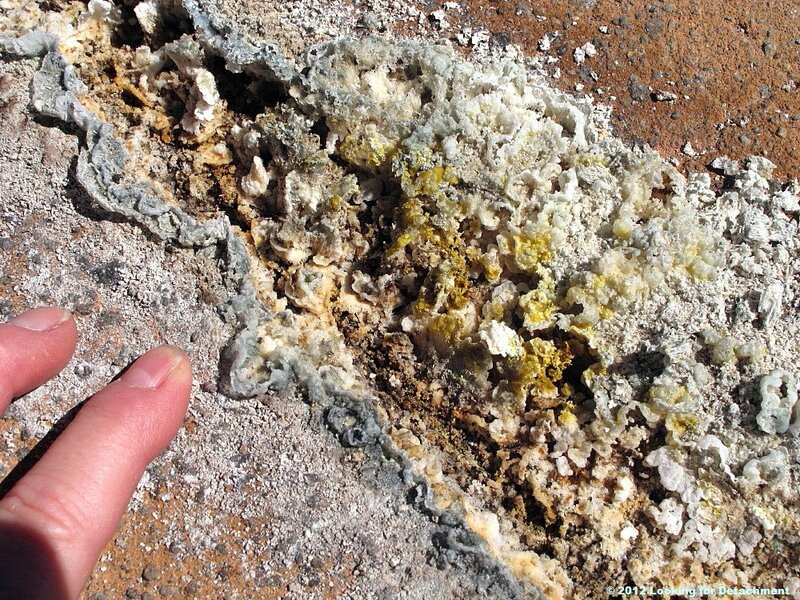 Gray, white, and yellowish growths, some of which might be Sulfur crystals. Closeup of some of the growths. While bending over to examine these flowery structures or growths, MOH noticed that the sidewalk was hotter than it should be, even for a bright, warm, sunny day. We didn't have our laser IR thermometer handy, so we made plans to revisit the area. Some classic wave clouds, or lenticulars, from the front that went through a couple days ago. The wave clouds in this photo indicate that winds aloft are blowing swiftly to the east (left). Note the iridescence in the brightest and thinnest parts of the clouds in the upper left. Also note the low rotor clouds below the wave, dark and scud-like, especially the one on the right, which may show hints of the rotation typical of these clouds, and which shows a classic ragged form. 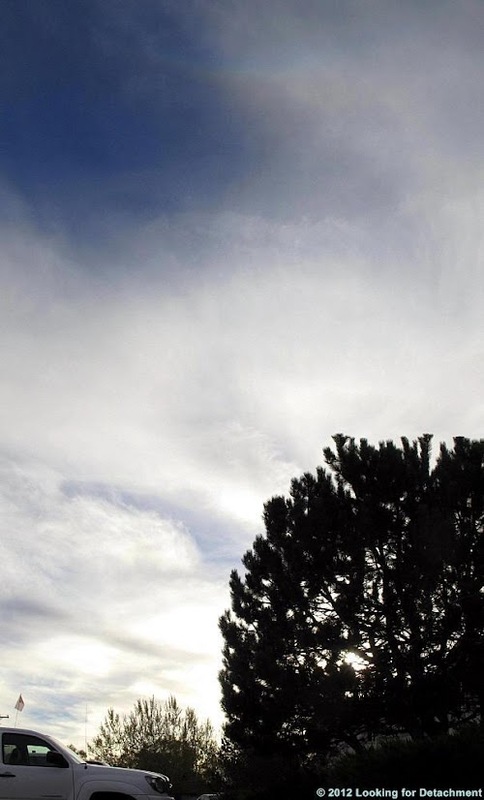 When conditions are right—when the wave is strong and the rotor is hitting the ground—winds on the ground will move opposite to the winds aloft, typically back to the west in Nevada (right in the photo). These "backwards" ground winds can be strong, erratic, and turbulent, and can cause unexpected damage to street signs and the like. In Nevada, when the rotor is blowing, it's a good idea to keep an eye out for flying sheet metal. 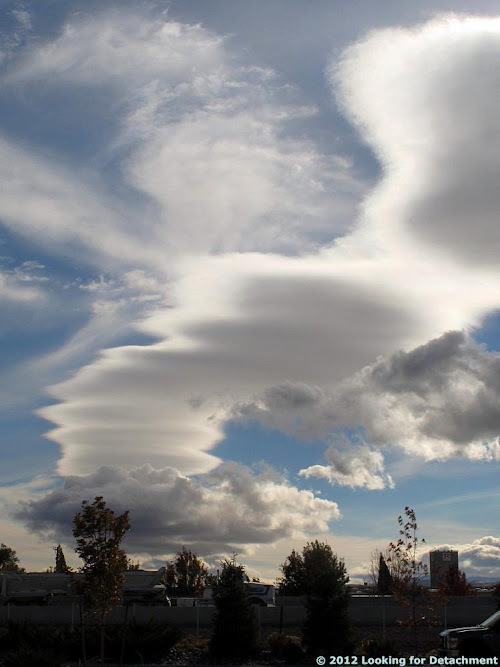 Lenticulars—which are sometimes described as unique, or even rare—are fairly common in Nevada, in the lee of the Sierra Nevada and the many mountain ranges of the Basin and Range. Photo taken 23Oct2012, Sparks, NV, from the Sheels parking lot. Dacite in a road cut just below the Lassen Peak parking lot. 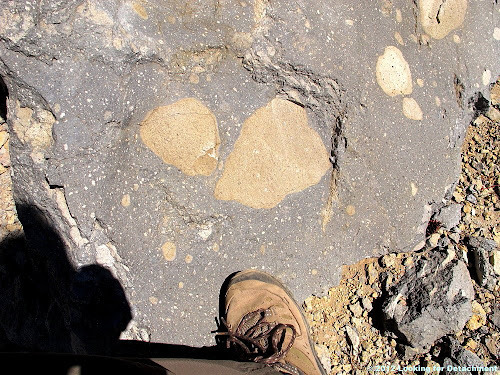 While at Lassen Volcanic National Park last month, we pulled over on our way back over the summit of Highway 89 to examine a roadcut that had grabbed my attention earlier in the day. A pullout overlooking Lake Helen on the west side of the road, not far south of the Lassen Peak parking lot, is a great place to stop; see this nearly identical Google Street View view of the same roadcut. Closer view of the dacite. Turns out that this is the dacite of Mount Helen, containing what are described here as mafic, phenocryst-poor inclusions. The inclusions are locally quite large and form as much as 20 percent of the rock. It is these large inclusions that grabbed my eye on our first pass through the area. 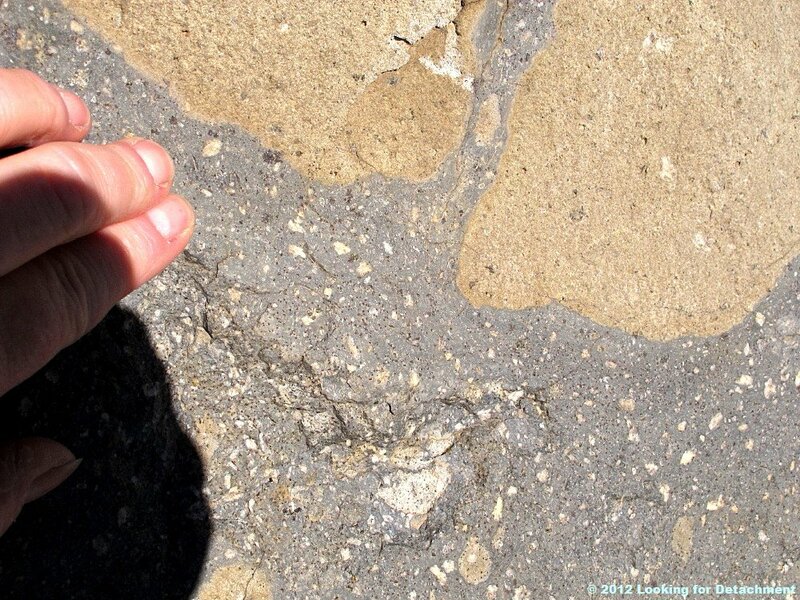 The inclusions or xenoliths were probably plucked from the walls of the dacitic magma chamber or from the volcanic throat through which the dacite erupted. The dacite of Mount Helen is middle Pleistocene in age (K-Ar date of 249±12 ka, Clynne and Muffler, 2010) and part of what is called the Bumpass sequence of the Lassen volcanic center, the youngest of several volcanic centers of the area. The several volcanic centers are shown in Figure 4 here, and described more extensively here. Portion of the Geologic map of Lassen Volcanic National Park and vicinity, California, Sheet 1, courtesy USGS. 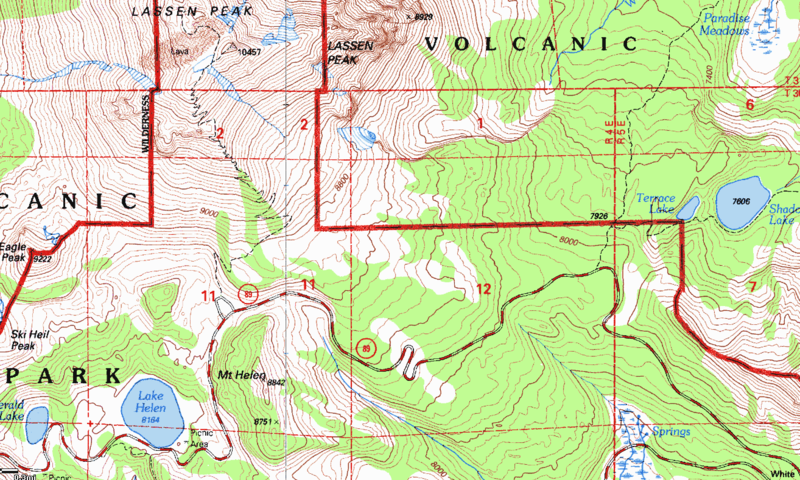 The dacite of Mount Helen is indicated as "dh" on the geologic map. Photos were taken just downhill and west of the peak of Mount Helen. 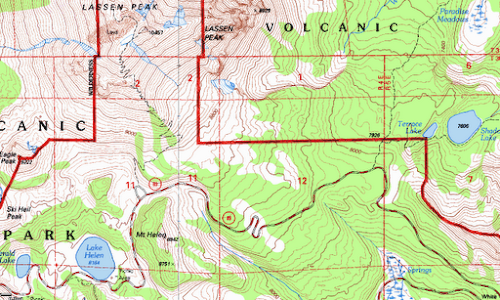 Clynne, M.A., and Muffler, L.J.P., 2010, Geologic map of Lassen Volcanic National Park and vicinity, California: U.S. Geological Survey Scientific Investigations Map 2899, scale 1:50,000. As part of Earth Science Week, today is Geologic Map Day! Long before I became a geologist, I had already developed a love of maps, a love dating back to a cross-country trip I took with my family when I was five. Besides the road maps we traveled with, I had a large wall map of the U.S., on which I kept track of the states I had visited and the roads that had taken me there—these were the major highways of the day, like U.S. Highway 40, now replaced by I-80 in most places. 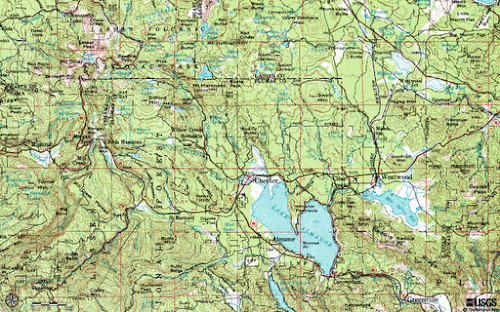 As time went on, I learned more about other types of maps, in part thanks to National Geographic, and eventually, maybe in high school, learned how to read topographic maps and came to know the basics of reading a geologic map. I got my first real taste of geologic mapping at field camp. I found it fairly challenging: I was still getting up to speed on the tools in use—simple tools like a quadrant-based Brunton compass—and I was also becoming gradually familiar with following contacts up and down and around hills, and across broad and hot expanses, mostly of desert. Geologic mapping really became fun for me on our second mapping project during the summer of 1978 (several early stories are listed here), when I found that I could do it well and that a good geologic map tells a story about what has taken place in an area during past geologic times. I learned then that preconceived ideas about how the geology of an area might be such and such, accompanied by ideas that certain processes or events couldn't have taken place, or that others must have taken place, often didn't fit with the story the rocks were trying to tell me. As geologic mappers, we must follow the contacts, over hill and dale as necessary; we must check out, ascertain, and describe the textures and rock types; we must follow basic geologic principles, while observing obvious signs and vague hints in the rocks that point to the order of events as shown by the principles of superposition and cross-cutting relationships. If the rocks are telling us something unexpected—or something thought to be unlikely or even impossible—we must listen to them. For myself, geologic mapping became much easier after I was willing to give up my limited preconceived ideas about what I should find out there in the field. Digital version at 1:2,500,000 scale, courtesy USGS. A geologic map is a thing of true beauty—although I don't really like the use of gray for Quaternary in this particular rendition of the geology of the 48 states. 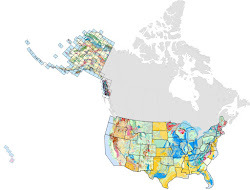 Map courtesy USGS Geologic maps of US states. Lakes in the far distance, looking southeast. From just southeast of the summit near Lassen Peak on Highway 89, a great view of two California lakes comes into view. 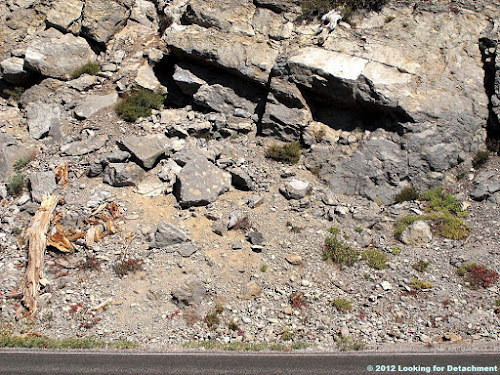 The stitched-together photo is stitched shows an apparently disconnected highway in the foreground; what you are really seeing is a couple of very sharp switchbacks going downhill past the outcrops of volcanic rocks in the closer foreground. Location of above photo: the hairpin turns SSE of the summit south of Lassen Peak, on Highway 89. From TNM 2.0 Viewer, courtesy USGS. The lakes are Mountain Meadows Reservoir AKA Walker Lake (MSRMaps location), near Westwood, CA, and Lake Almanor (MSRMaps location), near Chester, CA. 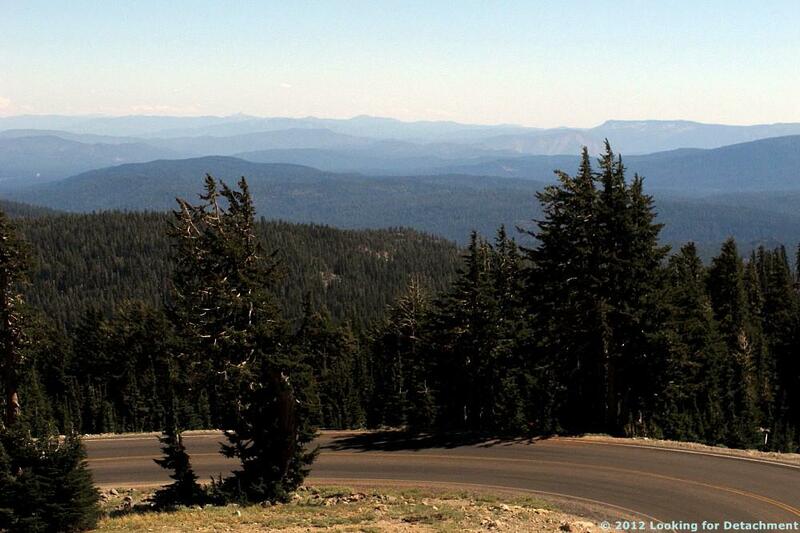 Two lakes, with Lassen Volcanic National Monument in the upper left. From TNM 2.0 Viewer, courtesy USGS. Both are part of the electrified chain of lakes and reservoirs along the Feather River and its tributaries, which goes all the way downstream to Lake Oroville and Oroville Dam. A somewhat enlarged view of the two lakes. Mountain Meadows Reservoir is in the distance on the left; Lake Almanor, a large lake, fills the slightly closer distance from the middle into the right of the photo. Note the trees on the far right. Possible fire scars from the Chips fire. 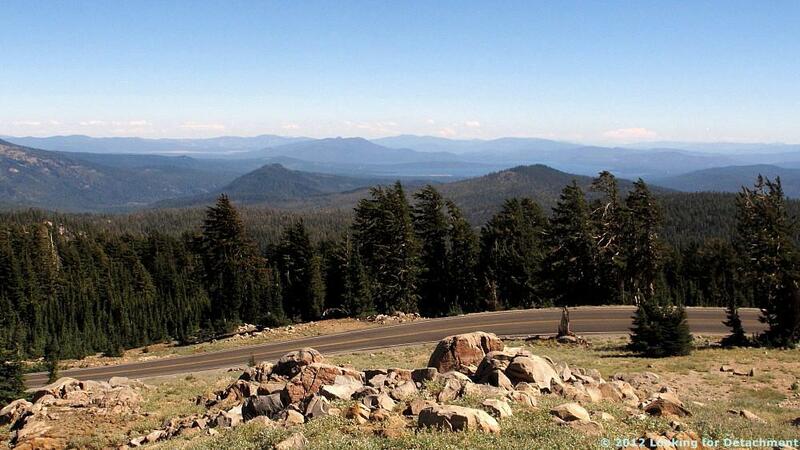 In this last photo, we've gone all the way to the right (west) of Lake Almanor; the trees on the far right in the previous photo are now left of center. Above the patch of trees right of center, a steep hillside and part of a table mesa have brownish slopes that may have been denuded by the Chips fire in the late summer of this year. 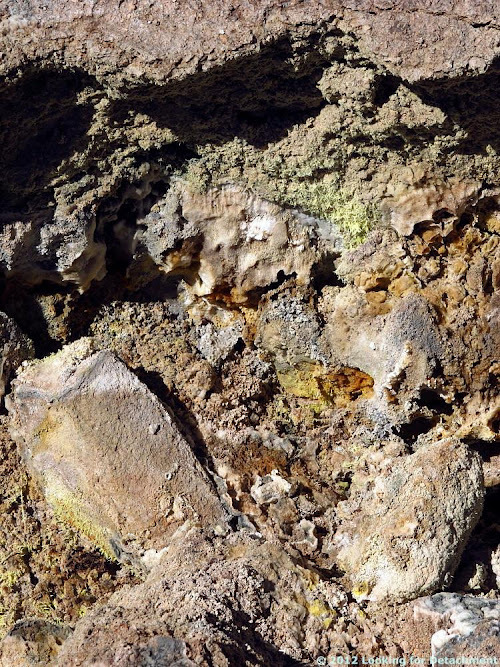 Minerals and other growths at Sulphur Works. Once again we are at Sulphur Works, Lassen Volcanic National Park, on the side of the road near the boiling mud pot, where MOH and I spotted some very neat greenish yellow crystals, which might be sulfur (upper right, center, and lower left). A somewhat closer view of crystals in the upper right of the first photo. The crystals seem a little long and pointed to me for sulfur, and copiapite, a sulfate known to occur in the area, usually occurs in scaly masses or crusts, so copiapite seems unlikely. 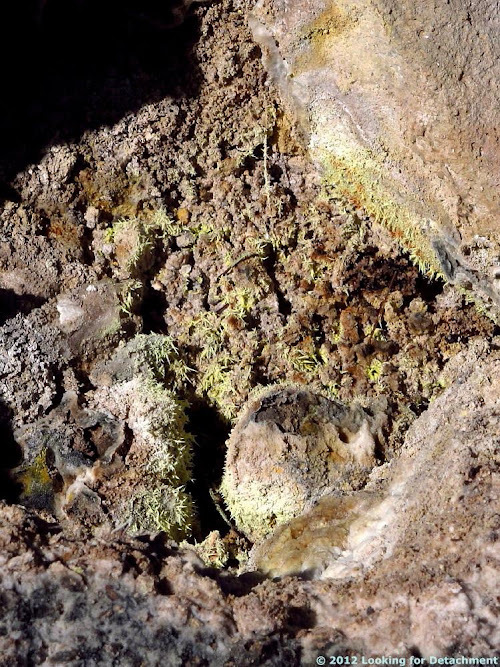 Greenish yellow crystals from the lower left of the first photo. Because of the location right next to the boiling mud pot, I couldn't just walk over to examine the crystals. 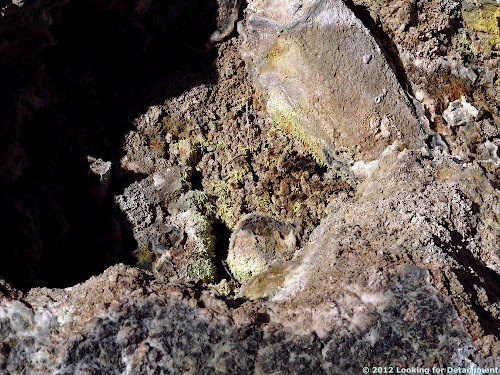 People have been known to break through thin crusts at the hydrothermal areas in the Lassen area, burning themselves, so I didn't even think about it! Close up of pointed, needle-like crystals. 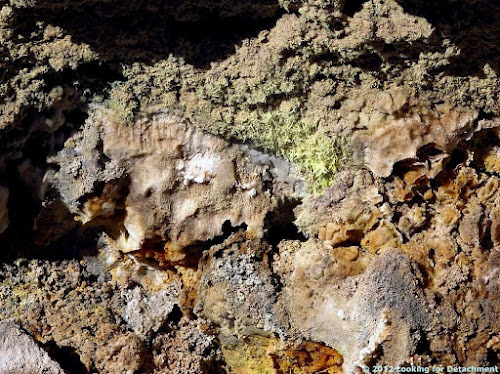 These crystals may be elongate versions of the Sulfur no. 1 shape shown at mindat.org. If you can't see the java applet at mindat (for some reason, I can't see it at the moment), go here to Sulfur at The Mineral & Gemstone Kingdom; it's the "Sharp Bipyramid" on the right. Or, view the applet at the source, smorf, by searching for, or using the dropdown menu to get to Sulfur. It's the second of the four crystals listed. 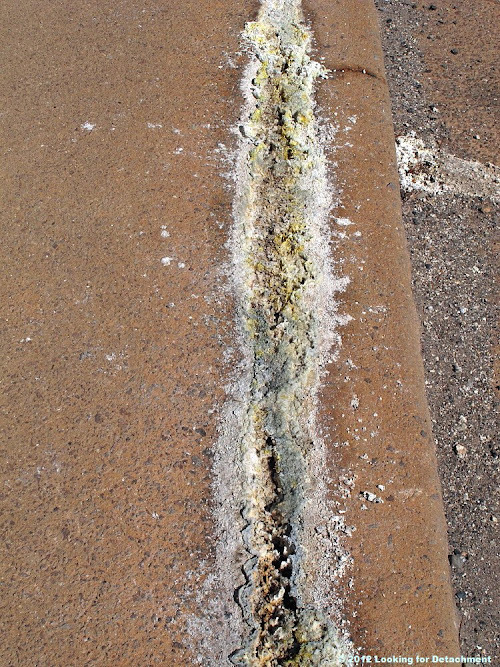 Photo examples of similar Sulfur crystals: 1) elongated crystals from the Jemez Mountains, NM, and 2) needle-like crystals at TheodoreGray.com, also shown here. So, is it Sulfur or something else? UPDATE 14Oct2012: In the comments, Ron Schott added a similar picture of Sulfur crystals from a fumarole at Nisyros Volcano, Greece, if anything, even more needle-like than these. 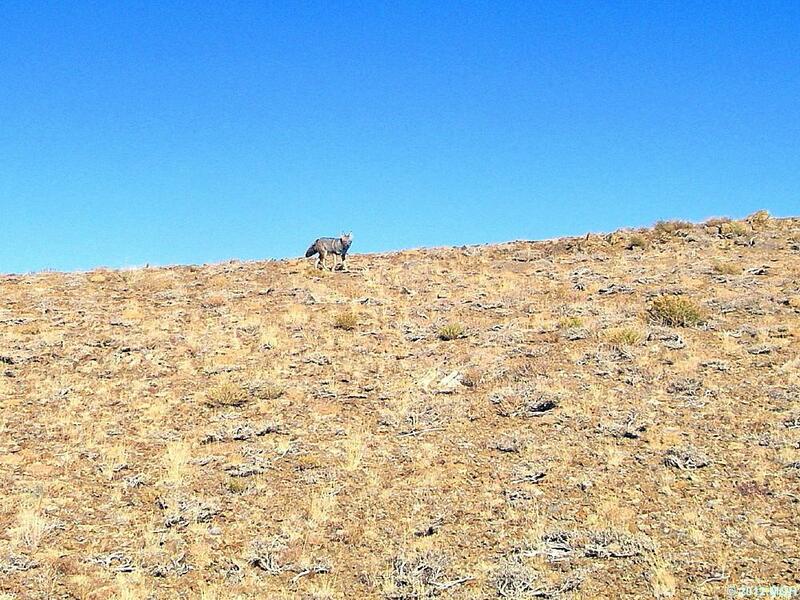 Coyote appears near the top of the summit. I have to admit, I rarely have had a camera handy when I've come close to coyotes out in the field—or, rather, when they have come close to me. 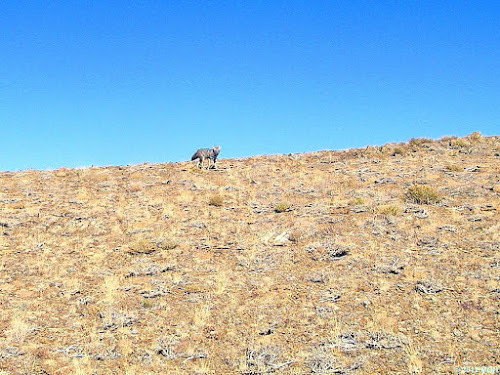 And I didn't have one this time, either: these are MOH's pictures of one healthy-looking coyote near the top of our current hiking hill in the Sonoma Range. 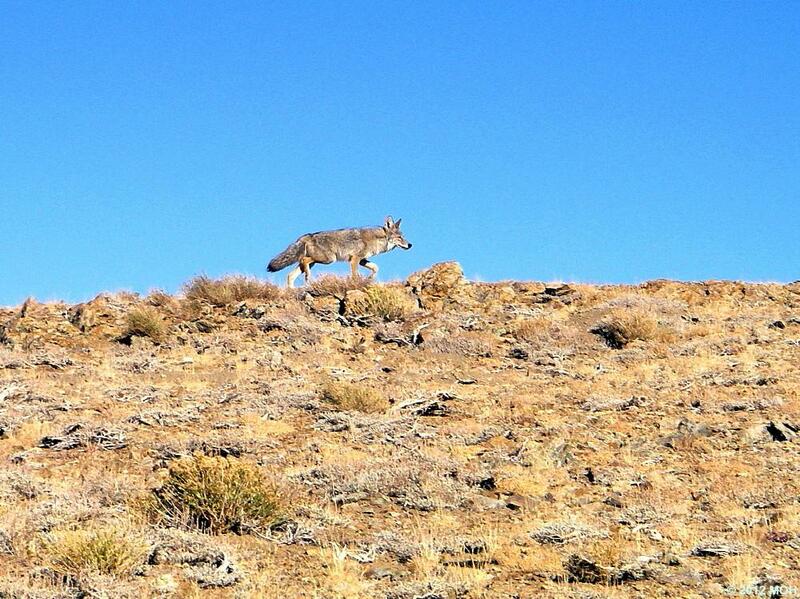 Coyote moves on down the ridgeline. Most of the times I've seen coyotes up close and personal, they have come to investigate me rather than the other way around. Once, I looked up from taking a stream sediment sample in the middle of nowhere somewhere north or northeast of Hot Creek Canyon in south-central Nevada, and three coyotes were standing 20 feet from me across the dry wash, staring at me. 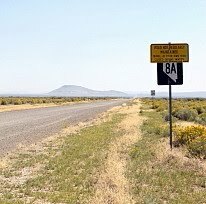 Maybe they were wondering what I was doing out there, as I sometimes did when the temperatures approached or exceeded 100° F. All my stuff was in the shade of a fairly tall tree (by Nevada standards, that's any tree you can't jump over). The coyotes were just barely out of the bushes and small trees on the other side of the wash. I stared back at them. We held a mutual staring contest while I considered whether they were dangerous. Were they rabid? No, they looked plenty healthy, of average size. Two may have been smaller than the one, possibly it was a small family or pack. Were they considering me as a possible dinner? I have no idea, but I considered my options, then carefully bent over and grabbed my two and a half pound sledge, which was leaning against my pack. They still hadn't moved. I moved the hammer into a more threatening position and walked toward them. As I stepped from the shade into the sun, they quickly disappeared into the brush. I never saw them again, but as I walked down the wash toward my helicopter pick-up point awaiting me at the end of the day, I wondered whether they had followed me, and I turned around to look back more than once. Back to field camp. One fun or memorable moment or time [there, I've done it: used "fun" as an adjective three times now!] was at our last mapping project in the Swisshelm Mountains of Arizona, helping to fight a range or brush fire that had broken out across part of the map area. It was an exciting thing for a new field geologist to experience; at the same time, there was a certain tension involved: would we succeed? would our map area be ruined? (there were good and bad points to this latter possibility); would we get burned or injured in anyway? For the latter consideration, I think we were mostly in the invincible category at the time and probably didn't think very much about the danger to ourselves or about our overall safety, which was not treated as a huge deal back then the way it is now. I was mostly involved in shoveling dirt onto hot spots around the edges, and in helping to move water containers to the lines. It was hot and smokey, the visibility was low, and my memory is tinged with orange. Memorable aspects of the day: we joined together in a common cause, we were fed dinner by ranchers also involved in the fire fighting, and the fire was stopped. I'm not sure whether we really cared that much about the range fire, at least not as much as the local ranchers or other fire fighters did, and we made jokes about hoping that the fire would at least burn down the cholla forest located on one of the east-west spurs of the north-south mountain—hoping at long last to be able to map that part of the spur, or to at least be able to walk through the area without massive attacks from stray cholla balls. No such luck, though. The fire burned through the forest, blackening the cholla and dropping cholla balls all over the area, if anything making the forest more impassable than before. Afterward, our mapping continued, under what turned out to be more difficult, not less difficult, circumstances: The limestone units and contacts in the upper hills had been reddened and obscured by fire retardant dropped from bombers. P.S. There is some confusion between jumping cholla and teddy bear cholla, with the former being more likely to grab onto you and being restricted to the deep southwest (California and Arizona deserts), and the latter being somewhat likely to grab onto you and being found as far north as the Gilbert mining district northwest of Tonopah, NV. This may be a jumping cholla rather than a teddy bear cholla, judging from the pictures shown at the previous USDA links. Keep this video in mind if you ever hear of anyone "flaming" chollas. It might be a case of revenge. UPDATE 5Oct12: Possibly we stayed here, at Faraway Ranch. The location looks good, the view of the area on Google Maps looks okay, although I can't tell if the buildings are right, and the pond might be gone. In the morning after I wake up—while I'm drinking my first, second, and maybe third cup of coffee—I often think of things to write for the blog, how to write them, maybe even what pictures to use. My thoughts while riding or driving into work typically run along the lines of...well, maybe it's time for some drilling stories...let's see, there was the guy who yelled and threw things when he was mad at his helpers, which was almost all the time. Ugh. Or, there's a story or two floating around about drill rigs brought onto staked claims in order to make a discovery before the company that owned the claims, thereby being able to, hopefully, make claim to at least some of the already staked ground. And then, once again, I'm back here at my computer, it's early morning, and the briefest hints of coffee are trying to course through my veins, trying to rev my brain. Ideas are at a standstill; I don't get very far...until I'm back on the road and the ideas start popping. Another story, or general story idea, will come into my head: mud and getting stuck stories. Hey, there's one just over that not-so distant hill! It happened not long ago, and, remarkably, I have a few photos for it! And not too much farther down that road and over the next hill or two to the south, there's a mud without stuckness story...and that leads to a more typical claim jumping story...which leads to another claim jumping story out of sight from this road but down a road I was writing about last fall and winter before I got distracted by our recent move. But then, I'm sure I'm missing something...maybe it's the details...because when these ideas start while I'm on the road (any road will do, me driving or sitting as a passenger, either way), other ideas come in and crowd out and confuse the first ideas, which then sometimes include other people's stories: other accounts with drillers, other encounters with mud, other overstaking problems. Which story to tell? What details to use? And, without a tablet, and even with a small notebook, how will these stories make it from barely incipient idea to fully written account? One story would be about the driller (and set of helpers?) that got thrown off a job down in the south-central Mojave one spring (I hope it was spring and not summer) for showing up to work drunk and carrying a small flask of whiskey or JD. The driller that came to replace him had an interesting time using one of the two only pay phones in town—and so did I, although I used the other of the two pay phones in town—but the guy that had real problems with the one pay phone, which was sitting there on the corner of Main Street and the cross street that formed the junction that made the town, was one of our claim stakers, who was out there running a soil grid across the claims he was staking. And his problems with the pay phone had something to do with the druggy nature of the town, the drugs being the second main reason for the town, the first reason being the intersection of two sub-major (major in the Mojave) roads. And so the ideas come and go, just like that, while I'm sitting here in the morning partly coffeed up, glancing constantly at the clock so I won't be late: sometimes the ideas get written down, sometimes they don't. These kinds of stories generally don't have photos to go with them, and the Mojave stories are not likely to have photos any time soon or in any systematic fashion: collecting the photos would take almost as long as the original years of exploration. And now, with one last chug of ever-so-good nice-and-hot coffee, I leave this post behind and start getting ready for work.